Google's recent announcement that it plans to go live with images it has collected of streets in 20 German cities has caused politicians to scramble to oppose the move in a country with laws that fiercely protect personal data. 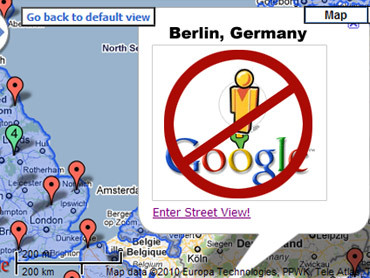 Der Spiegel reported that more than 10,000 Germans have sent letters opposing the service to the government, and the consumer ministry is expecting the number of citizens requesting to opt out - have their property blurred on Google Street view and expunged from Google servers - to rise above 200,000. But government officials were angered that Google announced their plans to move forward during August vacations - when most of the country is away on trips - and then only giving four weeks for people to request that their residence be removed. "The main reason for the concerns of privacy in Germany is the result of our dictatorship history with the Hitler regime and the German Democratic Republic, where we suffered suppression and surveillance by the state," said Thilo Weichert, the head of the Independent Center for Privacy Protection. "This made people very conscious about being controlled by the state, but also being controlled by private organizations." Weichert said that in the 1990s, Germans were wary about the amount of data that Microsoft collected, but the company has since taken strides to comply with a European idea of privacy, which often goes beyond what Americans consider to be private - not only personal information, but also includes information about one's living situation. The Google cameras filmed a height of about 3 yards high, high enough to see over fences and into gardens. "The cameras' perspective is not the perspective of a walker," said Christiane Schulzki-Haddouti, a journalist in Bonn who specializes in privacy issues and the Internet. "If Google had respected this problem it might have faced less opposition." Google, however, argues that Germans want the application. Street View Germany's manager, Raphael Leiteritz, told Spiegel that Germany uses the site more than any other country without Street View (Germany would be the 24th country to acquire it), good for more than 1 million hits a day. In a rare move, the company launched a national advertising campaign in Germany to promote the service, which uses photos of famous tourist attractions and emphasizes that users can turn to Street View for vacation and business trips. Despite the usage rate, Klemens Skibicki, a professor for marketing at Cologne Business School and a social media consultant said that many residents don't understand what Street View does. "I talked to people who think that Google is looking directly into their homes and taping it," Skibicki said. "Others are afraid that somebody can now better prepare to rob your house. Almost none of these people have ever seen Street View and therefore seen the benefits." A German Web site, www.sightwalk.de, already has street photographs of many German cities, but didn't draw attention because it wasn't a major company like Google, Skibicki said. German legislators and cabinet members are currently considering adjustments to their Data Protection Act to not only tackle Street View, but also take on fears about data collection from companies like Facebook and Apple, but there have been no concrete decisions on how to handle internet privacy, as politicians have mostly called for boycotts or tried to appeal to companies. "Caught between the skepticism of the one camp and the euphoria of the other, Germany's politicians are struggling to find a position on the matter," Spiegel writes. "But in so doing they are wasting valuable time when it comes to defining the boundaries that need to be set."